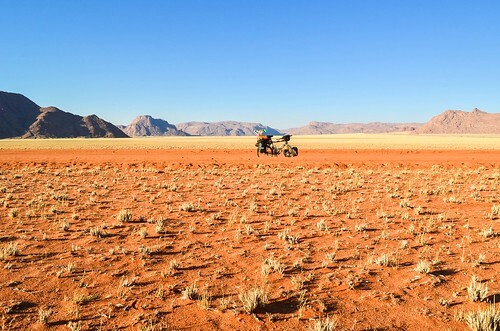 In Namibia more than in any other country, my first thought, as soon as I get out of the tent, is to squeeze my tires. And this morning again, my front tire is slightly deflated. Pff … another slow leak. Naturally, I must change the tube and patch it now, while I have shade and water. It was a tiny puncture. I don’t know how I managed to cycle my first 10’000 kilometers without a single puncture, while I have now something going wrong every three days. Sure, my gear is not that new anymore, but the tires are. Or, probably, the Schwalbe Marathon Mondial folding were really a league above all others. The D707 starts right now. 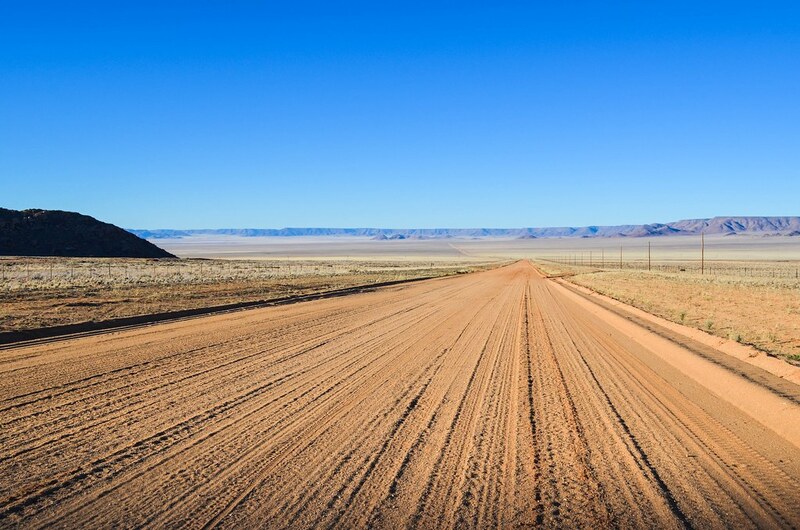 From what I gathered about this road, the 200 km until the village named Aus would fall into the following category: poor surface (sand / loose gravel), little traffic (5 / 10 cars a day), lonely (+/- 1 farm visible from the road), extremely scenic. My 10 liters of water are packed, I fill up my stomach as well, and let’s go! So far, the road is not bad. It’s not the best of Namibia, but it’s still great. 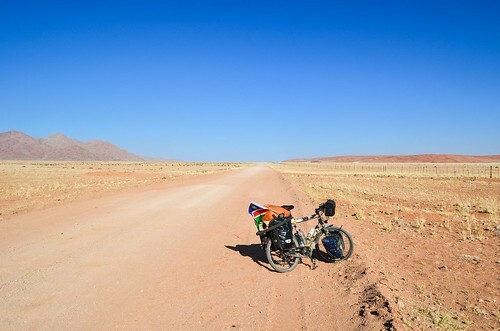 It’s very remote … and at one point, my bike is standing in the middle of the road, waiting for me to take pictures, when a bakkie stops by. It’s a vehicle from a leopard conservation organization, and the driver tells me he’s also a cyclist, he has crossed South America, and he’s staying now at the Kanaan farm. It seems biblical references are common for naming farms, and I have already heard about that one. The Belgian cyclists I met in Twyfelfontein told me they had to go there to fetch water, and because it’s 10 km off the road, at the end of a sand track, they left their bikes, walked to the farm, and asked for a bakkie and water. It would certainly be nice to spend the evening chatting with another cyclist, but if it involves 10 km of pushing my bicycle in the sand … hmmm, that requires careful evaluation. Anyway, I’ve only started my day, so I’ll consider it again when time comes. I actually see one non-motorized human during my day. It’s a man sitting under a tree with black sheep. With sheep? Why would he do that here? I got the answer later: there’s actually little option to value the bare land of Namibia and make it work: if there is no uranium or precious minerals underground, the owner is only left with 1- cattle farming (it’s hard work and produces meat, tasty but not really comparable with gold), 2- tourism (easy foreign currencies, but it’s a pain to deal with tourists who expect value for their money),or 3- swakara. Swakara is the Namibian name for the Karakul, also called Persian lamb, a breed of sheep originally from the desert regions of Central Asia. They can survive under extremely harsh living conditions and their pelt is highly prized in the fashion/luxury industry. They sell for an average of 50 € per pelt, and the sick part is that the pelt needs to be from a newborn lamb under 3 days of age to be valuable. And even more valuable, are pelts from unborn lambs (yes, they take the baby from the womb days before birth because it’s shinier that way)(and it is done by opening the mother up). I barely cycled 50 km by the time I reach the turn-off for the Kanaan farm. But since I left later than expected because of my flat tire, and made a long break to cook lunch under one of the only trees of that section, it’s already 4 pm. What shall I do? Struggle 10 km out of the way, in the sand, to have a beer with another cyclist, or not? 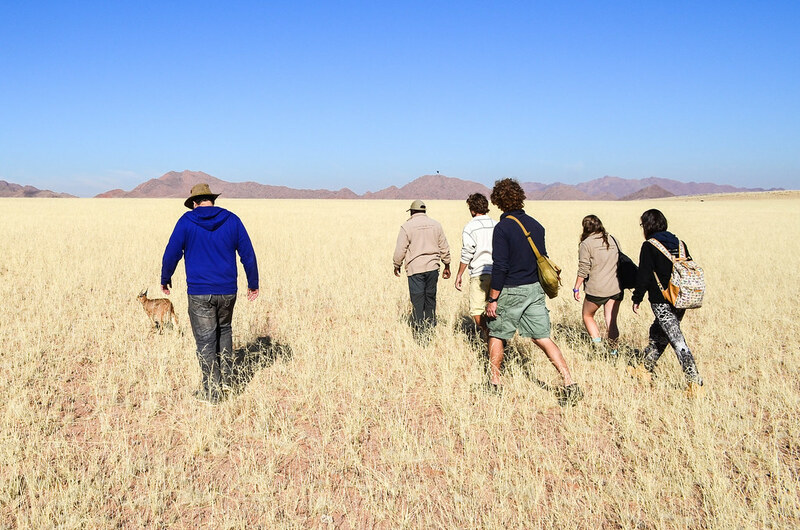 After all, social moments in the Southern Namib don’t happen often, so let’s do it. And this way, I’ll be refilled with water for tomorrow. I currently still have 5 L left, and that would last only until tomorrow morning. 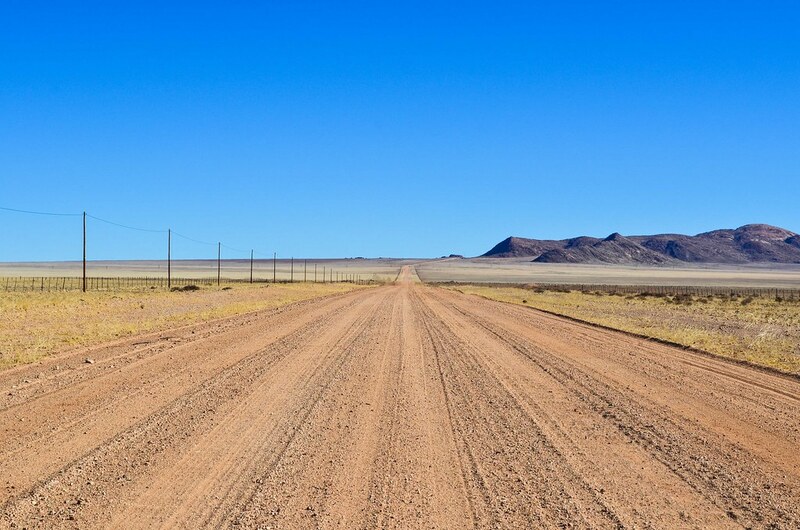 The road to the Kanaan farm is actually not as terrible as I thought. I can cycle most of it, and push the rest in the sand. And I really love it to be in the middle of nowhere. 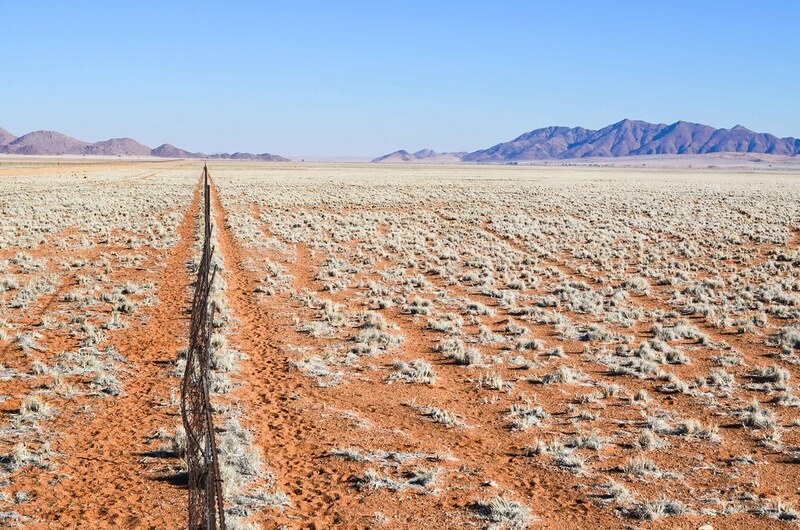 The remoteness reminds me of Mongolia. I wish someone would take a picture of me from above, or a satellite, so that I can unzoom myself on Google Earth and still not see a sign of urbanization after ten clicks. By the way, earlier in the day, I’ve seen a plane flying over me. 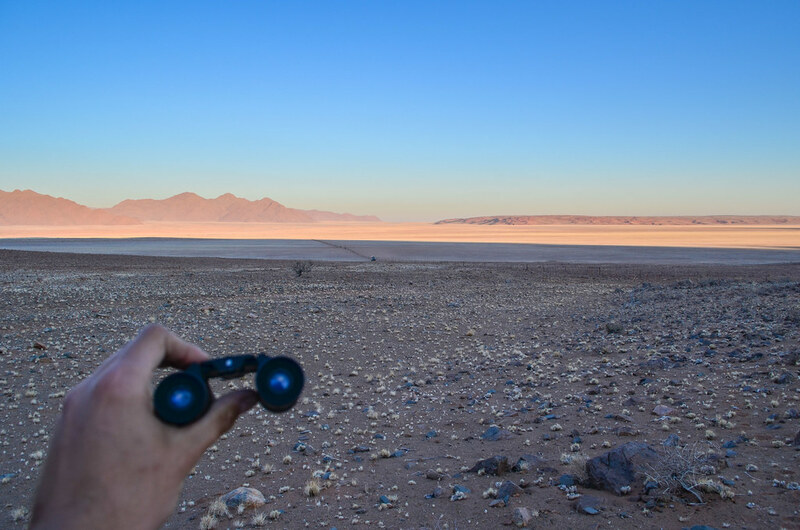 Maybe tourists enjoying the never-ending views of the desert? The feeling is exhilarating. Without any fence or man-made structure, it’s so flat, and so big! I feel super tiny. 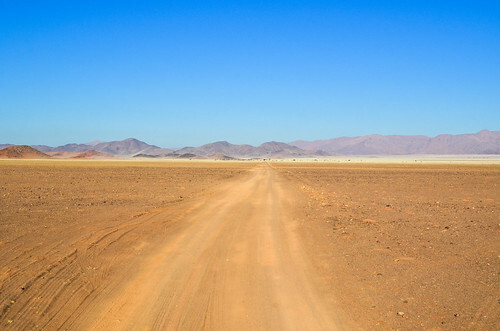 I can see a herd of ostriches running from my left to my right, kilometers away. Then they stop, make a U-turn, and run back. If we could rate that, I wouldn’t hesitate saying that ostriches are some of the dumbest animals on our planet. If they were not running that fast, evolution would have surely taken care of them. With a cruise speed of 50 km/h and peak speeds up to 70 km/h, they are the world’s fastest two-legged animals. 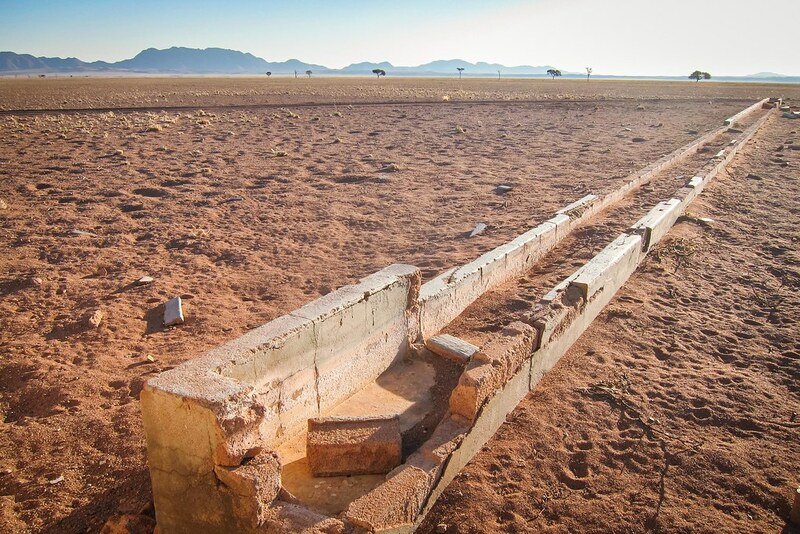 Now who’s best at dreaming impossible challenges: Richard Branson or Namibian farmers? 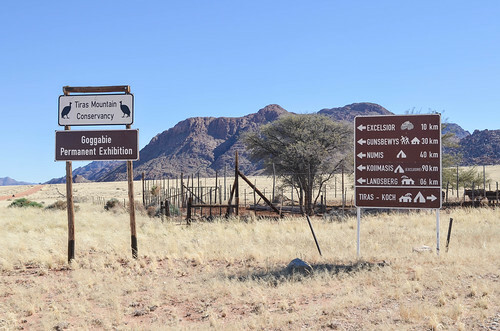 They just moved here on the behalf of N/a’an ku sê, a highly regarded wildlife conservation foundation. It is the same foundation where Hildegaard, who I met in Tsumeb, at the other extremity of the country, used to work. So, obviously, they know each other. 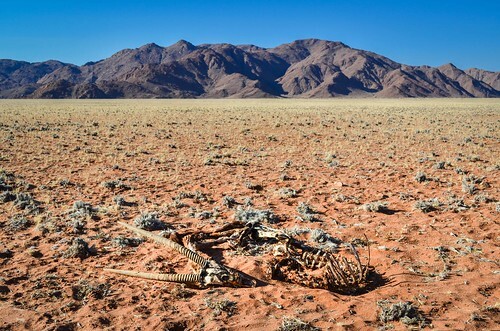 I had already written as a joke about how knowing five Namibians is like being connected to half of the country, and this joke is becoming more and more realistic. 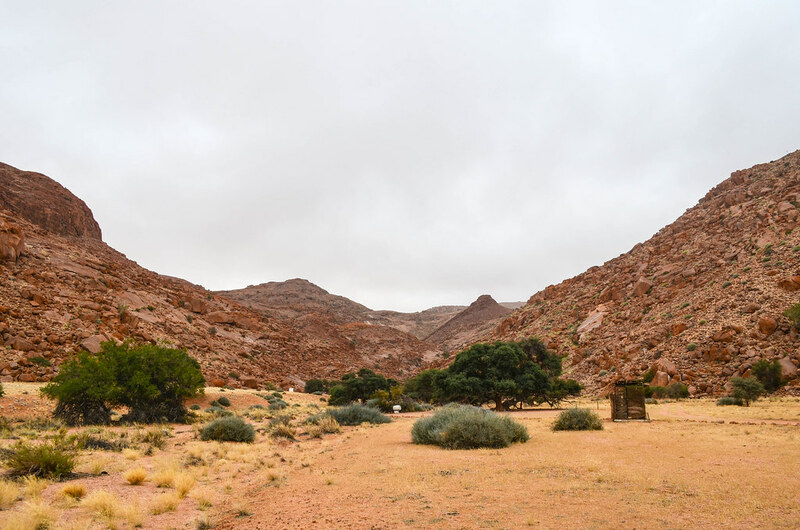 The Kanaan farm is simply huge: 33’000 hectares of desert. It is as big as two Liechtensteins or one Malta, all this land being just a playground for the foundation’s animals. Before building my tent next to the caracal’s cage, I kill time sharing a beer with a former national Namibian rugby player who visited France for the 1999 world cup. My hosts are very busy taking care of their business visitors, a photography crew. And not any photography crew: it’s Vogue. Well, the stylist is at Vogue and she was the personal stylist of Michael Jackson. One of the assistants is the daughter of J … of a famous Hollywood actor (it’s a secret). 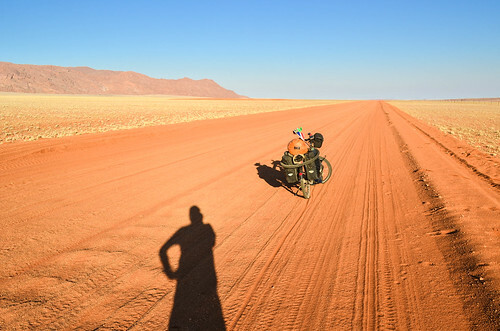 I don’t know how famous the photographer and the model are, but for sure, me coming from the dust and suddenly having dinner (still in the middle of nowhere) among fashion people, something sounds wrong. The hairdresser is from New York and proudly states he takes a cab for travelling four blocks. Yes, something definitely sounds wrong here. My beard feels out of fashion but I’m very excited at watching this meeting between two extremes of our planet. The farm is not completely “ready” yet for welcoming people with high expectations (like a bed and a hot shower), so the most important part of the crew is hosted in the very comfy house, in place of the wildlife volunteers, while the rest has to stay in tents mounted in haste a hundred meters away. 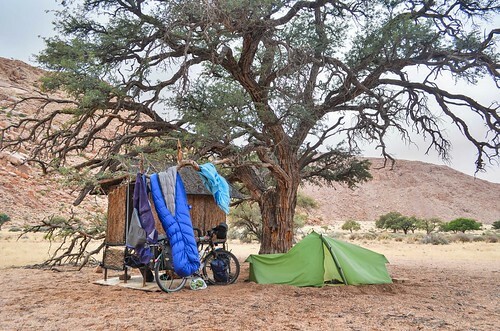 It’s still a fancy camping, equipped with portable showers and hot water from a wood fired donkey. I am told that if I get up early enough, I can see the cheetahs being “loaded” into the bakkie and taken to the photoshoot location. I struggle to get up in the cold at 5 am, to put my hat with my eyes still closed, but I know that what’s happening today won’t happen every day. The fashion people are not only nonsense in themselves, they also create nonsense. They wanted to shoot in Kanaan with two cheetahs, an eagle, and a wild cat. 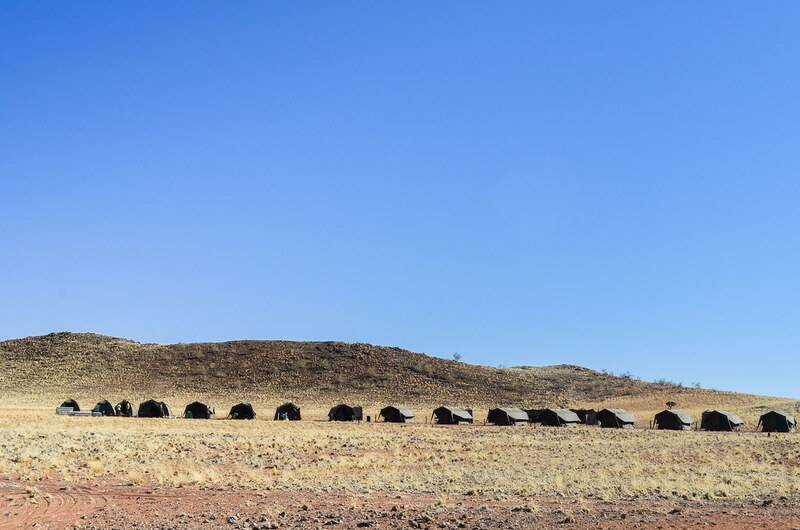 Since N/a’an ku sê is not established here yet, they had to fly these animals from the foundation’s headquarters near Windhoek … which explains the small planes I have seen above my head yesterday: it was cheetahs flying for the lenses of a photographer. Their project is about travelling taking pictures in very remote places and make it look like another planet. But that’s not enough: in the previous days, they also had a lion shipped … and Himbas! The Himbas only live in the bush more than 1000 KM away in the north of the country. There are a few in Windhoek on Independence street selling their art work to visitors. I can imagine them sitting half naked on the ground of the craft market, freezing because Windhoek is much colder than Kaokoland and nobody walks half-naked there, and trying to sell wooden stuff, when they were suddenly approached: “Hey, here’s some money if you come with me right now, and we fly two hours into the desert, take a picture, and I fly you back“. No really, from a practical point of view, fashion can only be about nonsense. And I guess when they offer the money for it, few will turn it down. 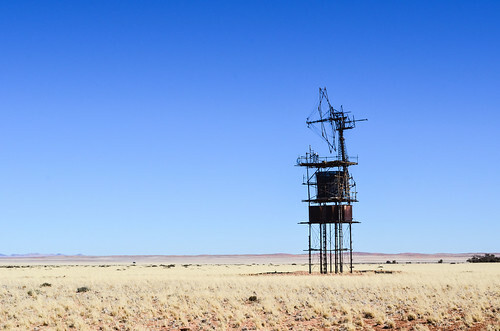 In a single day, they had a plane three times flying between Windhoek and Kanaan. So, I show up this morning at the enclosure for the cheetahs. It’s a small space, also built in haste, to host the two cheetahs flown from Windhoek. It’s still dark. Theo and Marlice are there, trying to get the cheetahs to jump into the bakkie. It’s not an easy task. Marlice says the cheetahs are stressed and need time to get ready. After all, they are wild animals, right? The photo crew wanted real Namibian cheetahs, not zoo cheetahs. But isn’t a real cheetah posing for a photoshoot an oxymoron? The money earned by the foundation from other industries is probably worth the pain and the nonsense, since the animals won’t pay themselves to get healed and conserved. Marlice had appeared in a cute Volkswagen ad, and that scene where Lucky the cheetah climbs into the car was apparently a pain to capture. “Just get into the enclosure“, they tell me. Eh? 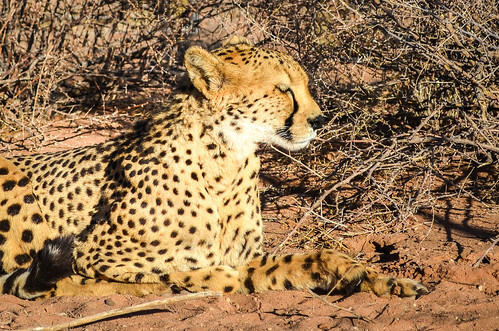 Half-awake me and wild cheetahs together? It’s not like being in a tourist park where animals are specifically trained from birth to be pet by tourists. These ones are rescued orphans and injured, and meant to be released in the optimal conditions. Cheetahs and leopards look alike, but they have differences, including the black “tear lines” that run from the corner of their eyes down the sides of their nose to their mouth. They are both walking around me, looking at the open trunk of the bakkie and maybe thinking “Damn, here again they want us to go to what they call work. But we’re cats, so we’re staying here. They can’t stop feeding up anyway!“. I let my hands run on their backs, and it’s impressive. It feels like they are only made of muscles. Muscles that purr like a little engine. 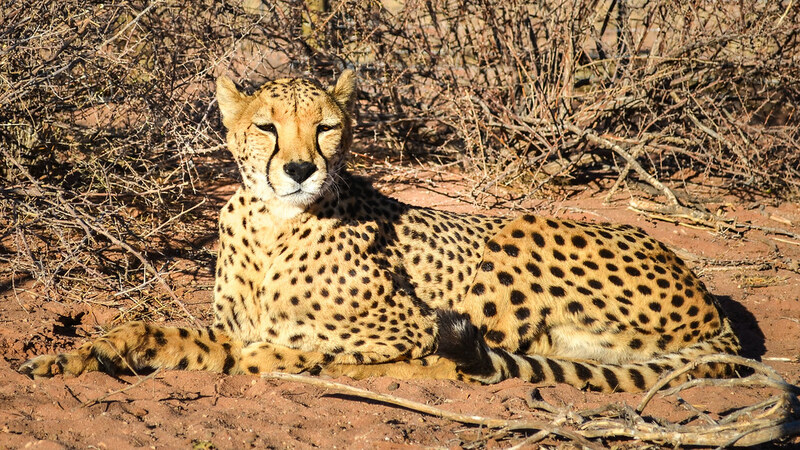 After all, they are the fastest land mammals, and can accelerate from 0 to 100 km/h in three seconds. Maybe I’m just enjoying what car lovers feel when petting a Bugatti. In the meantime, Augusta suggests that I stay at the farm for the day, and while they deal with the photo crew, I can join the volunteers. Why not? There is a lot to talk about volunteers from the western countries who pay a lot of money and come to “Africa” to build schools or to help children in hospitals – with no skills at all in construction or health. It may not be the smartest thing to do, but in the end, everybody is happy: some made money, while others travel back home with pictures of Black children smiling and possibly lions. The volunteering at the farm is about wildlife. Our first task of the day is walking the caracal. As, obviously, there’s little chance that a fresh graduate from the UK can handle on her own a wild cat, and even less chances that she will learn it being 10 days on site, we are accompanied at all times by the guy(s) who know the work. That’s how I learnt about this position, “volunteer coordinator” (a paid one), which is about making volunteers (the ones who pay) feel like they are working. And as he resumes it well, it’s more “voluntourism” than “volunteering”. I personally wouldn’t pay for experiences that I can create myself, in a much more raw, vulnerable, and authentic way (and cheaper too! ), but I’m enjoying this day out. The caracal is an animal I had never heard of. 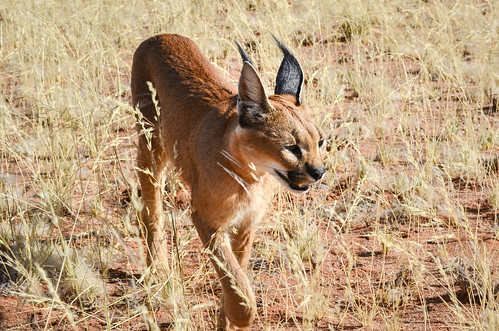 Also called desert lynx, it’s like a beautiful athletic cat with batman’s ears. Cute enough to make me wanting to hold it, especially when it rubs itself against my legs, but wild enough to make me refraining from putting my fingers near his head. It’s quite a unique experience to see the caracal walking in the dry herbs of the Namib and playing around our legs. We hope to see it finding something, and it eventually catches and eats a lizard. Thinking about a wild cat being followed by a foundation worker, a volunteer coordinator, four volunteers, and a cyclist taking a day off, can sound slightly strange if I compare it to, let’s say Gabon, where each piece of wildlife is a meal not cooked yet. Or, it can also sound completely natural, if I think that the daughter of a famous Hollywood actor is helping the stylist of Michael Jackson setting up a scene with a donkey in a boat in the desert a few kilometers away. Ha ha, this day is totally worth a week cycling of cycling on dirt roads! 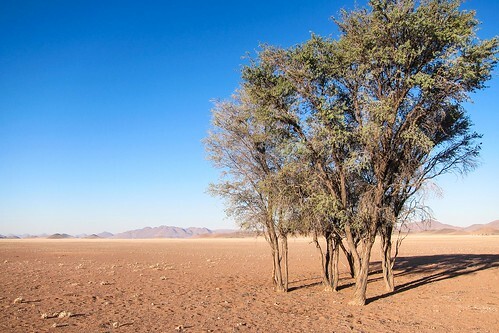 Oh, and by the way, there is another funny thing to think about: if you read this, you believe in the six degrees of separation, and you know me, then Angelina and Brad, who have a Namibian child, are just 3 or 4 degrees away from you, since they are supporters and friends of the foundation. The photo crew is leaving the farm during lunch time, alongside with 9 suitcases of clothes for the model. Does the fact that the stylist of Michael Jackson, who is now working with Jay-Z and Nicki Minaj, rudely asked me to stop enjoying my breakfast in order to carry some suitcases for her, allows me to say that Nikki Minaj is of rank 2 in the six degrees of separation? How come I consider now such irrelevant possibilities, when my only interrogations have always been similar to “do I have enough water with me?“. 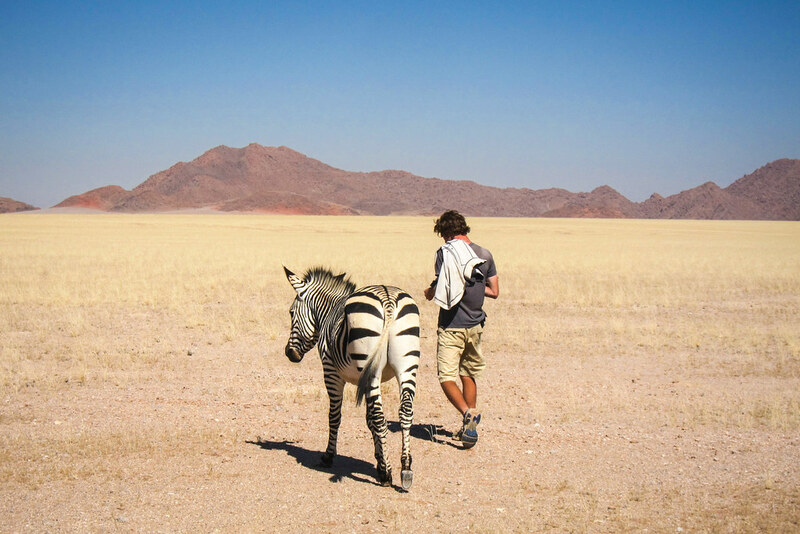 We walk the zebra in the afternoon, and being not as cute and much more stubborn than a wild cat, the task is much less interesting. After wondering how would we call the animal resulting from the mating of the zebra with the donkey sharing the same fenced park, I discover a dead animal behind the ruins of a watering trough. 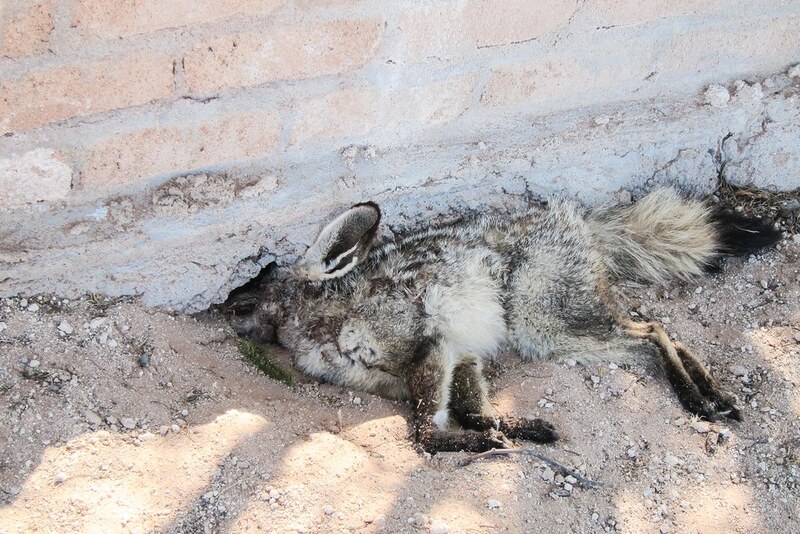 It looks like a small wild fox, and carries a risk of diseases that could be transmitted to the farm dogs. We end the day with a game mapping exercise: in a bakkie, we tour farm and count the animals we spot, with details like numbers, gender and location. 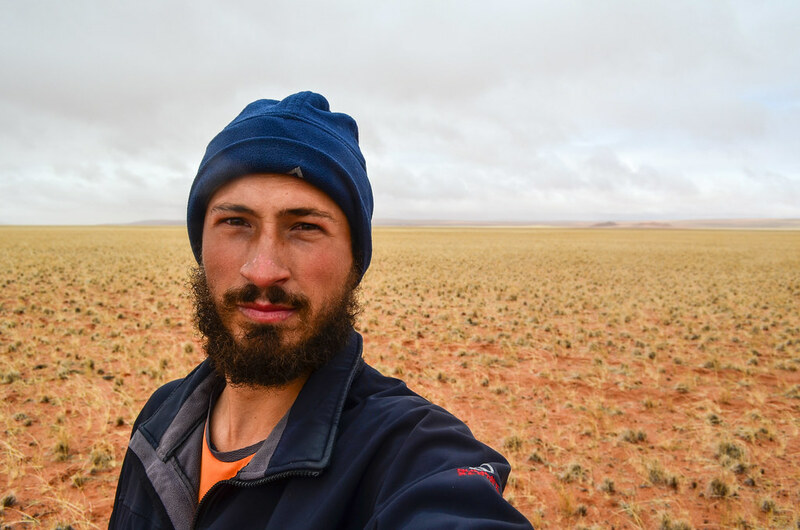 We see less wildlife than what I see on a usual cycling day on remote roads, but it’s interesting to listen to the volunteer coordinator explaining how he can identify the gender of an ostrich that I can barely see, or how he can read the soil and tell which animal did what. I thought I’d sleep perfectly after this exhausting and special day, but I managed to make nightmares. If I have dreams or nightmares, it’s almost always about having my bike stolen or broken, my wheels bending, my spokes disappearing, etc. Since my bike is the most precious item of my journey, my dreams are intense. Empowered by my unexpected encounter with wild cats, the return onto the D707 is fast. But it doesn’t mean I will go far today: I then spend an hour pushing my bike in the sandy dirt road. Then I can cycle a little. Then I have to push again. It’s not easy, but at least I’m in a very special landscape. The D707 runs between the Tiras mountains, on my left, and the red dunes of the Namib desert, on my right. 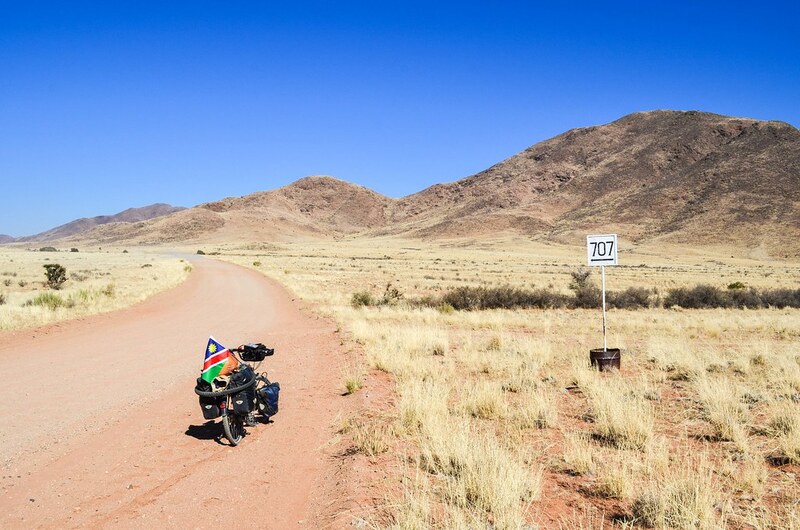 I wouldn’t call it “the most beautiful road of Namibia”, but it’s well worth the struggle. 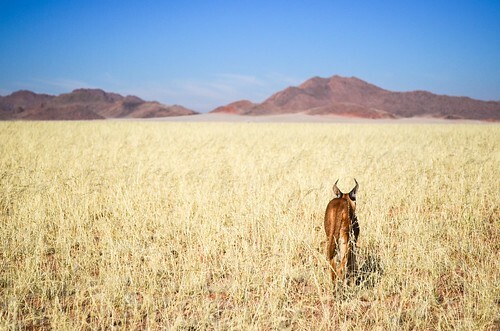 There are many oryx and they are not too far. Many more than tourists. I can’t make it to the next farm before the night. I see some structures far away, but it would take me at least 1h30min to reach them. Thus, I jump over a fence (I rarely do that, but now I have no choice) and head to the mountains after 2 km of private dirt road, marked as a dotted line on OpenStreetMap. It leads me to an abandoned campsite. Well sheltered in a narrow valley, I had strong wind all night long, and much to my surprise, a grey sky in the morning. 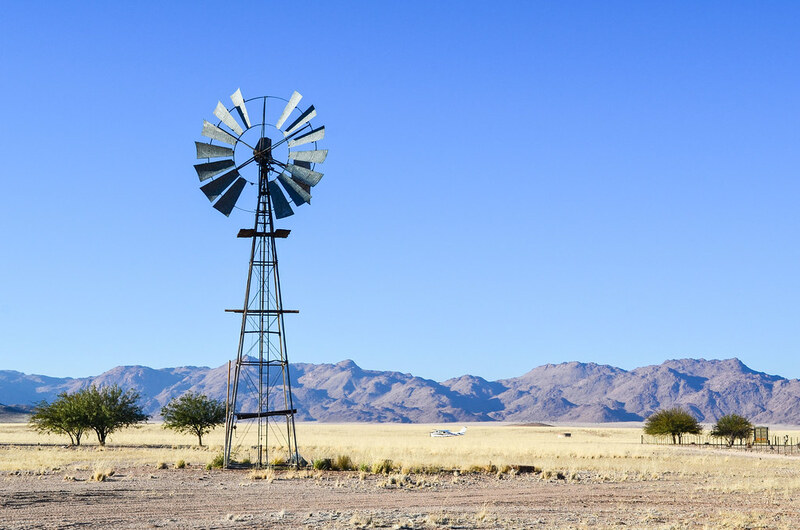 What’s wrong with Namibia? The strong wind will not cease and there’s even a bit of water in my tent. It’s drizzling! It feels so strange … it’s the first time in ages that the sky is not perfect blue. I can’t even see a blue patch above my head. And it’s very cold. 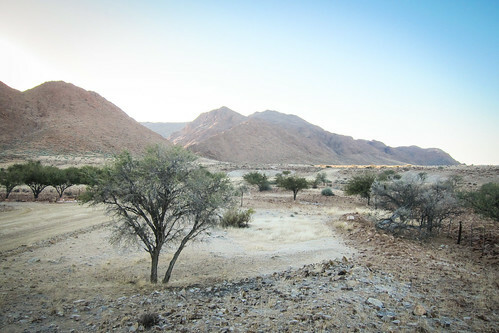 It is indeed quite unusual for me not to feel at home while wild camping in Namibia. I would usually integrate perfectly with the landscape. I try to run up the hills of the Tirasberg, to see how far these clouds extend, but quit halfway to the top as I fear the drizzle will threaten my tent not packed yet. I am in a way kicked out. And as unload the bike to carry it over the fence, after 2 km only, the drizzle turns into proper light rain. The wind blows it horizontally and it doesn’t take much before I get completely drenched. I can see as far as 1 km maximum. 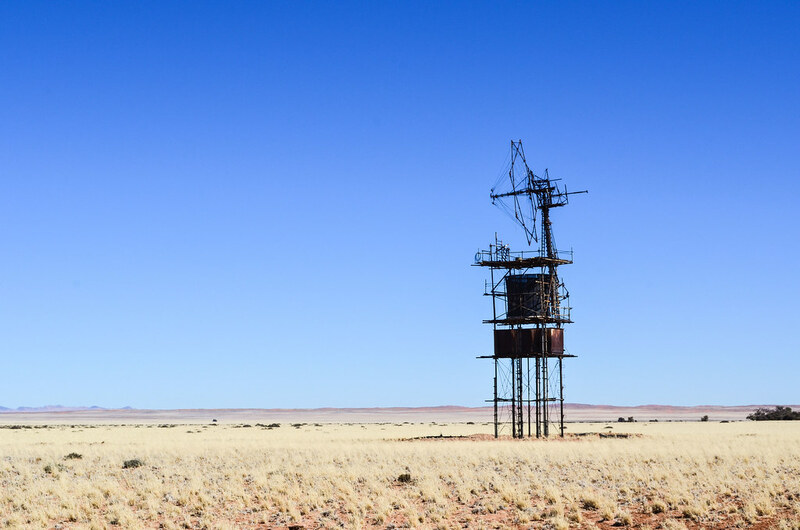 No, really, what’s happening Namibia? I didn’t experience rain since March, four months ago. I am freezing and wet, but let’s move on. Looking at the positive, I am going faster than under a blue sky: it’s too cold to take a break, and especially, the dirt and sand surface is hardened by the rain. I can almost cycle normally without having to push. 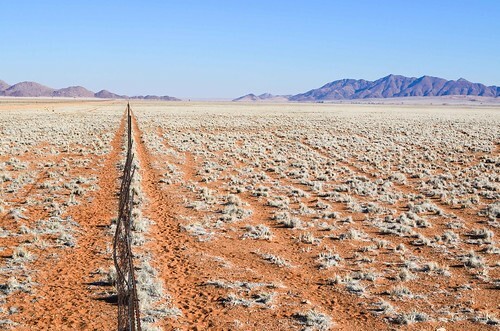 And here comes a clear example of the threat fences pose to wildlife: as usual, fences run along the road, as this long stretch of nothing belongs to someone who marked its territory. 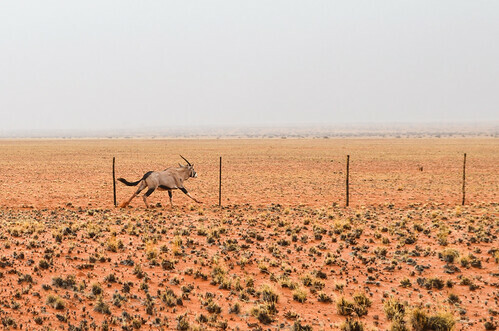 I can guess a cattle grid ahead of me, and an oryx stuck between the grid and me: it can’t jump over the grid, and is too scared to pass close by me. It thus tries to hit the fence on both side, losing a horn in the vain battle, before running along the fence and getting behind me. 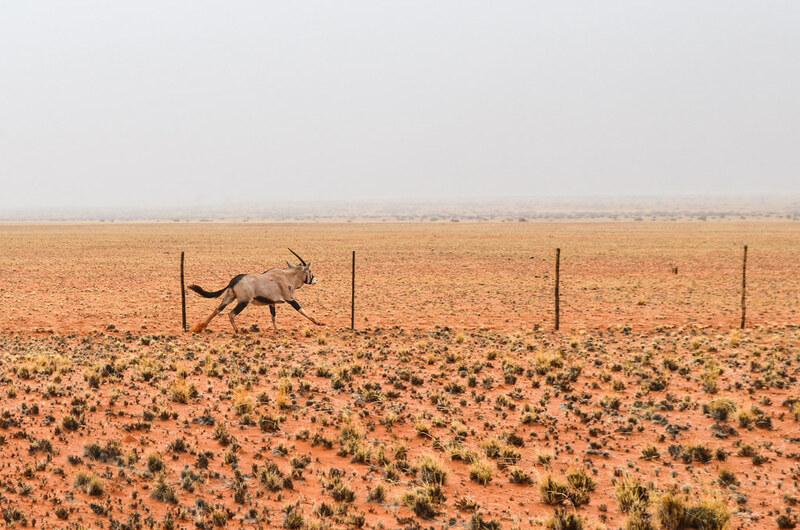 Now this oryx will have to survive with a single horn. I finally stop for a dröewors break once the rain is over. And I notice my rear rack is slightly loose. 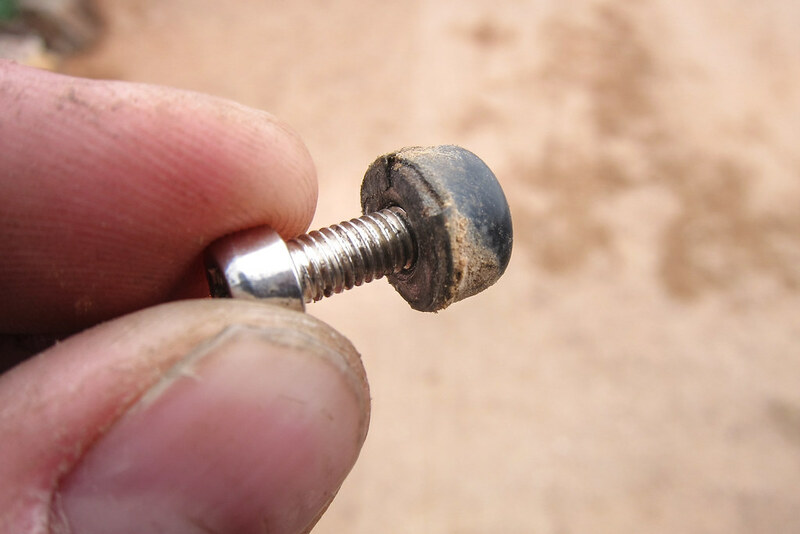 Am I loosing the screw again? Hmmm no … Panic! The frame has broken. The braze-on rack mount broke off the frame. This tiny nut supports half of the load of the rear rack, on the right hand side, near the wheel sprocket. It’s terrible, and it’s definitely the biggest bike problem I have ever faced. The bike itself is fine, but if I can’t carry my luggage, I won’t be able to continue. The load of the rear rack is now entirely supported by the screw on the other side, and it won’t take long before it breaks too. 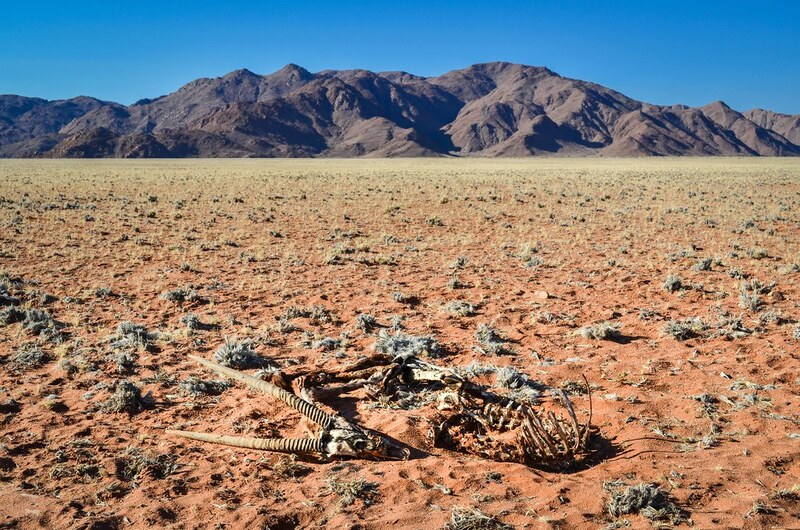 I surely can’t make it to Cape Town. I can’t repair the frame. 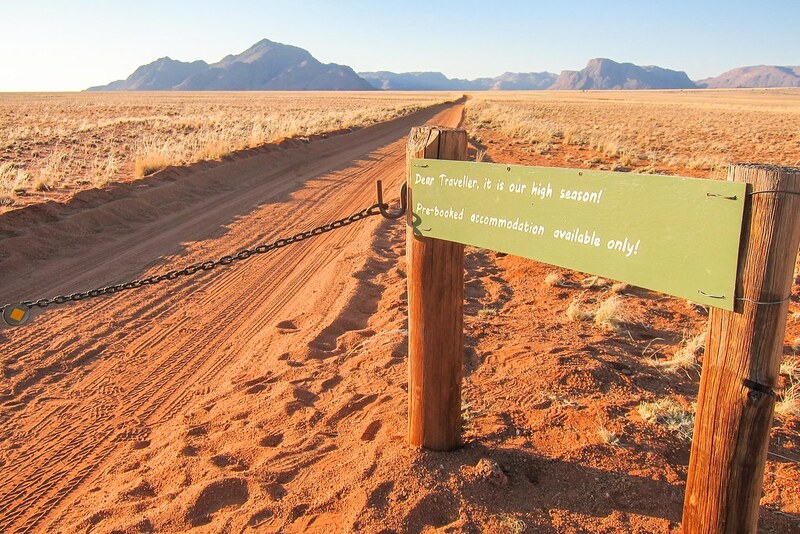 Without panicking too much, I wonder what happens if my trip ends here, will I feel OK if my journey sounds like Zürich – Windhoek? 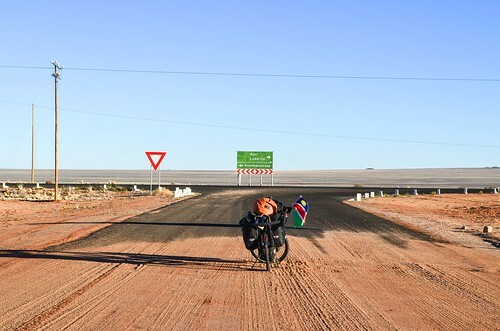 If I ditch my rear luggage (clothes, tent, sleeping bag, mattress, bike spares), I could possibly speed to Cape Town on the tar road and sleep at hotels? Damn … it’s terrible and I feel so low. I know I’ve been very lucky that this kind of problem didn’t happen in less practical locations, say Gabon or Angola, but with wet clothes, grey sky, on a sand road, I can hardly find the bright side of life. I slowly regain my sanity and senses: this thingy must be weldable. After all, my whole gear is made of steel for that reason: it’s heavier, but it can be repaired in any workshop around the world, and ridden further. I made the experience in Iceland, where I had a truck workshop weld the Tubus front rack the airline company broke, and the welder did a very good job. This time, it’s not the rack, but the frame itself. Had it been the rack, I could buy another cheap Chinese one. Because it is the frame, the only part that can’t be replaced, I have to get it fixed. It’s CrMo steel, so it must be possible. Later in the afternoon, I meet a farm on my left. It is called Excelsior. 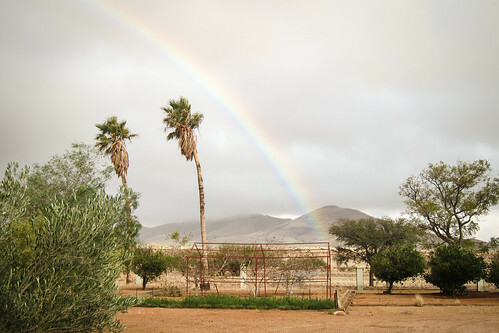 It is not often that farms are right by the road, and since I need water and positive words, I stop by. The owner Wilhem is at home. I ask him about the possibility of finding a welder in Aus, and he replies “Hmm .. in Aus, they may not be able to do that, but let’s see what we can do here“. 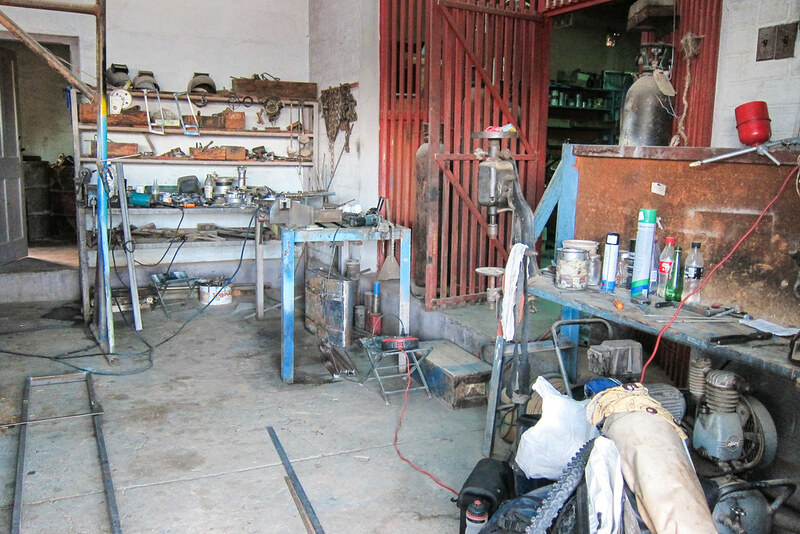 The Excelsior farm has an in-house workshop: welding machine, a huge second hand drill press bought from the South African railways, plenty of tools, etc. I have actually an incredible luck that the first farm on my way, after a mere 20 km of depressed-cycling, is so well equipped. A moderate incredible luck, if I think deeper and realize that most of the White farmers of Southern Africa are in general tough guys who grow their own food, process their own meat, and repair their own trucks. Well, it’s time for surgery: I unload the luggage, remove the rear rack and wheel, and place my naked bike onto the table. 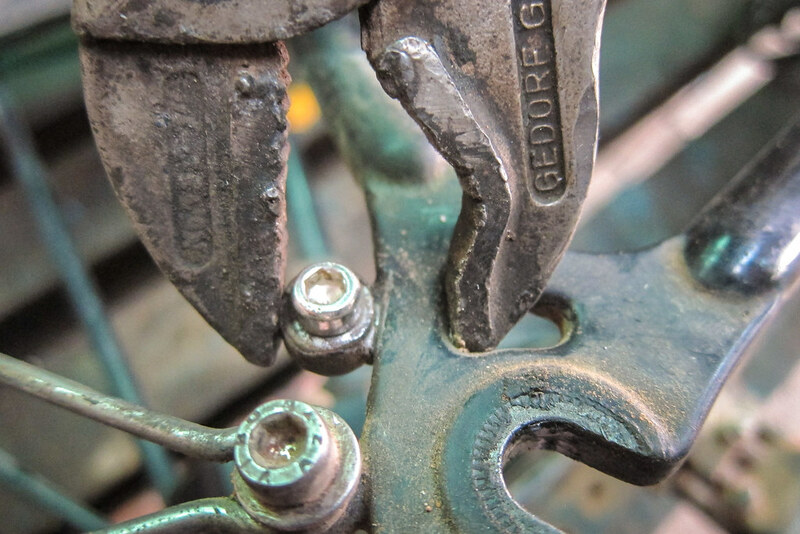 Wilhem has a welding machine, and I hope he can weld the tiny braze-on nut to the frame. Contemplating the task, he announces it’s hard. “Can you weld?“, he asks me. Not really, and I expected him to be skilled at it. Is he not? “I can weld, but my eyes are bad. We can try, otherwise we must wait for my son who comes back tonight“. At that point, I really wish I knew welding, since even the VLOOKUP function, which usually solves all problems known on Earth, can’t help me here. 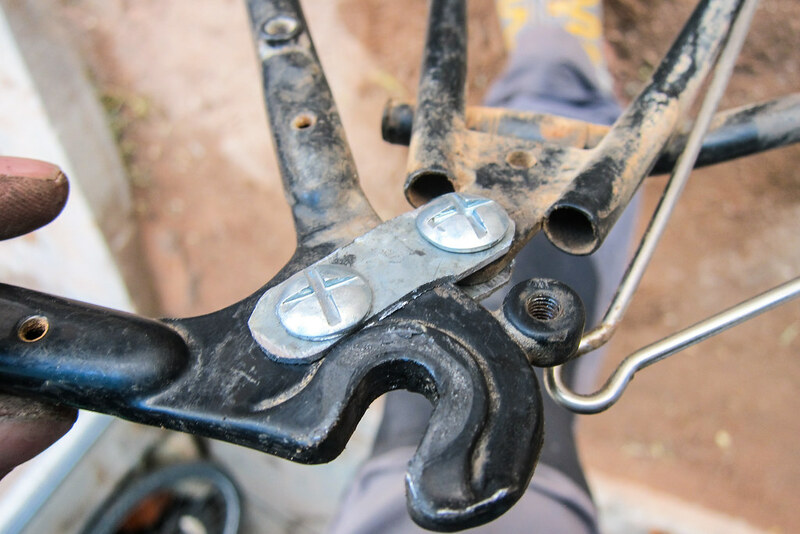 We manage to hold the broken braze-on nut in position with locking pliers, and luckily Wilhem finds in his storage a chrome electrode to start the job. I step back a little when the welding sparks push me away, but I’m so worried I can’t find the energy to take a photo. Looking at my bike under fire on the operating table, I feel as bad as when going to the dentist and having him operating drilling tools into my mouth, hoping that he doesn’t screw up my teeth. It’s even worse, actually, since it would be like if the dentist had said “My eyes are bad, but I can try something“, and I had opened my mouth saying “Hmmm okay, go ahead“. I hope he doesn’t bend the dropouts. If I can’t mount my rear wheel back, it’s even worse than trying to ride until Cape Town with cable ties in place of nuts and bolts. After a few seconds, the sparks stop and we are looking at the quality of the weld. Hmmm … it looks so-so. 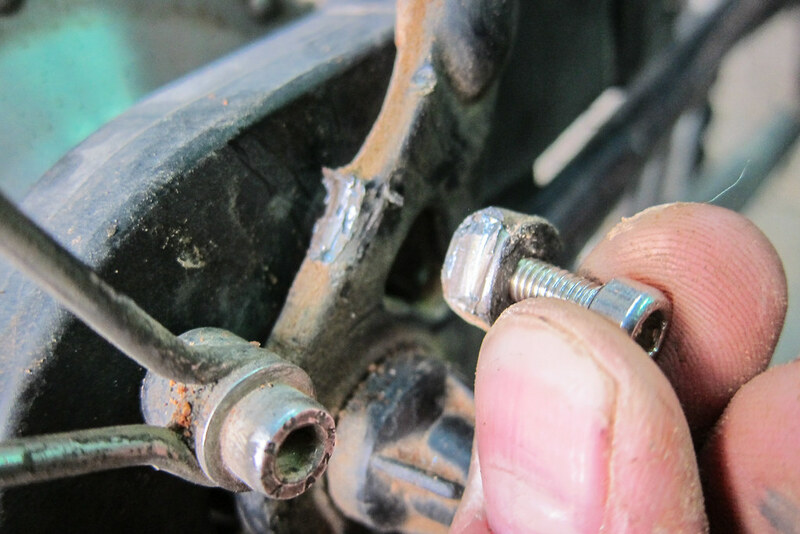 The bolt comes off: good sign, it hasn’t been welded to the nut. But the nut falls off. The metal has been deposited onto the frame dropouts, without holding the nut. It’s a fail, and Wilhem immediately takes the grinder to clean the mess. I feel super bad again, as I see him grinding a part of the dropouts too. At best, it will change the geometry and the rear wheel won’t be centered anymore. At worst, if this super critical part of the frame is weakened, it’s really the end of my journey (with or without a bad fall). The grinding ends, and my stress level comes down. The problem is not solved, but at least the frame dropouts are still alive. So, it seems it’s not possible to weld this tiny nut back onto the frame. It has already been a good thing that it worked until now, considering the too many kilometers of bad roads I have been riding. On the other side of the frame, the mount is more reliable, since the nut is inside the dropout plate, instead of a braze-on. It keeps the rear rack in place at the same height as it should be, but about 5 mm closer to the wheel. Since the Tubus racks are rather flexible, it looks like it can absorb the slight asymmetry. I discover in the process that Americans are messing up even the most remote locations on Earth with their imperial sizes, as fixing a M6 bolt would have me looking at the 10 mm spanner in the toolbox, but here the 3/8 US won’t work. 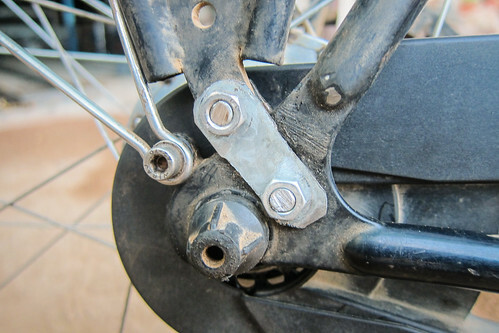 The bolts have pretty flat heads and it fits perfectly on the chain side, with a 1 mm gap to the chainglider. It looks alright and I truly hope this fix holds on until Cape Town. For sure, I will have to refrain myself from taking terrible roads just for fun, and stay on tar if possible. I take the opportunity to clean the sand in the chain links and mount the rack for a loaded mini trial run around the farm. It seems sturdy enough. I feel so much better now. Thanks Wilhem! 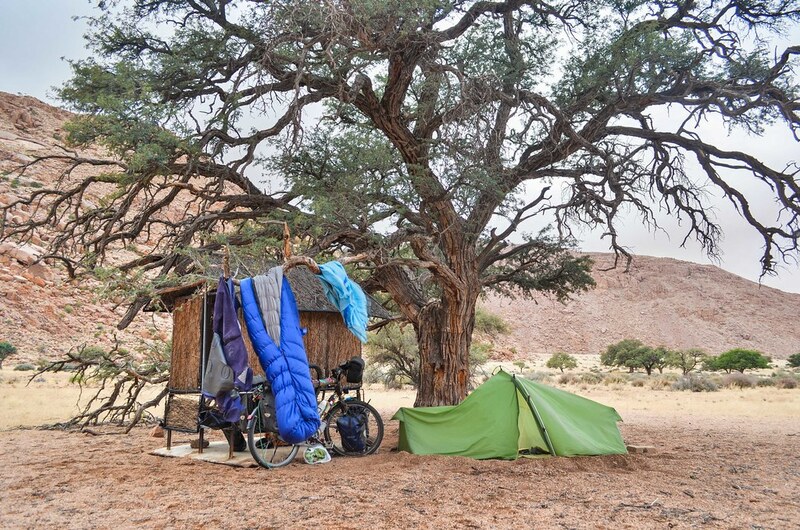 Just like all the times I have thrown myself on tough remote roads, and found a place to camp/stay at the last minute, my days are really emotional roller coasters. I don’t know how I will avoid being bored if I return to a well organized lifestyle. “All’s Well That Ends Well“. This rainbow must be a sign. It’s sunset soon and I’m quite glad that this bad day is over. What a struggle for 37 KM only. Dröewors and the Excelsior farm have saved it. Wilhem offers that I spend the night at the farm, in the “caravan”. But first, he says “Let me take the car, I must call my wife“. His son drove his wife to Lüderitz to the nearest doctor, and that’s 200 KM away. 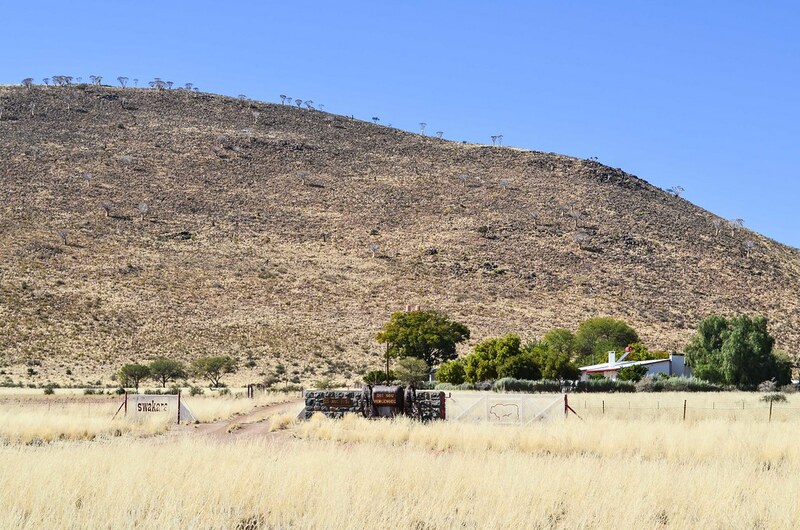 There is no phone signal at the farm, so Wilhem must drive to the bottom of the next hill, where his son built a solar repeater to catch the cellphone signal from Aus. 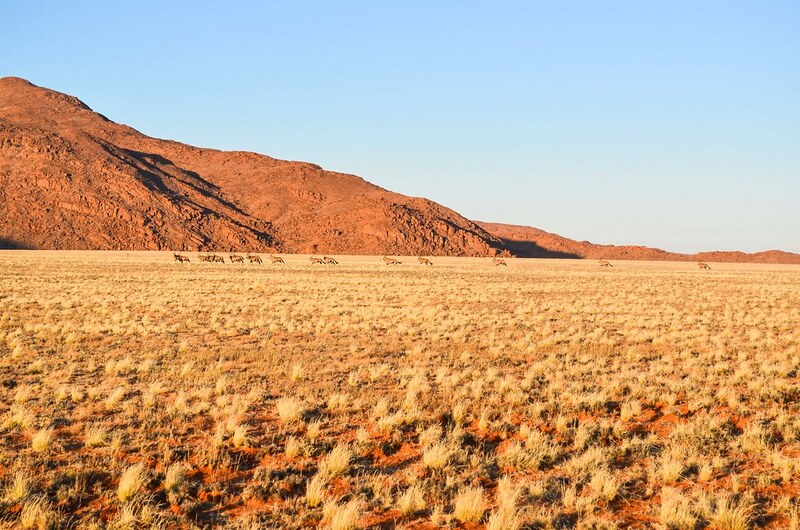 At this precise location, 60 km from Aus with an unobstructed view, the repeater increases the signal strength of the Aus antenna, designed for a network radius of 30 km only. 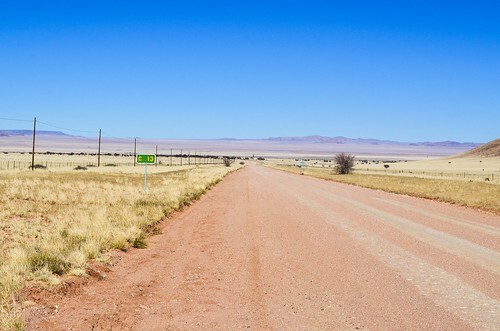 The D707, despite being nicknamed the “garden route of Namibia“, has no signal on its 200 km length, which makes it tricky to help travelers having an accident there. In July, when South Africans take their holidays and often use this road to go up north, the surface worsens quickly and accidents will happen. As an illustration, my hosts tell me they learnt about the 9/11 attacks only two days later. No phone, no TV, no radio. I sleep in the caravan under repair, where my digital Swiss army knife indicates a temperature of 7°C inside in the evening … It will be a cold night! 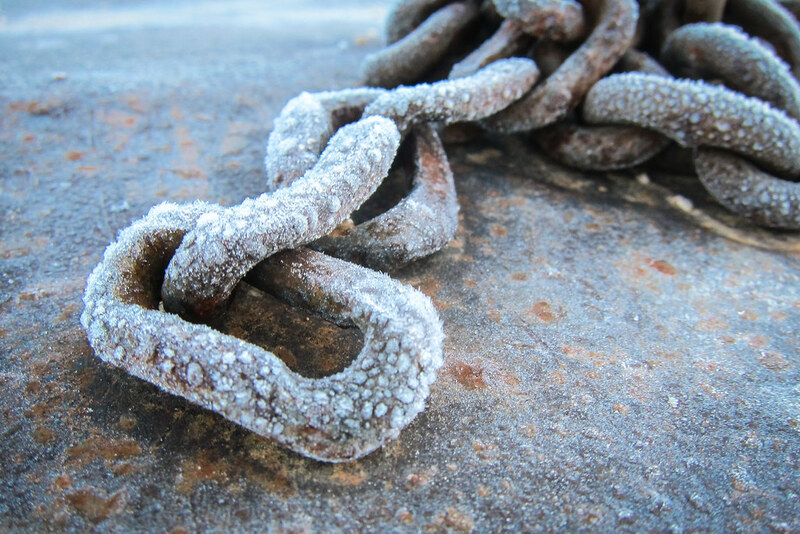 And I wake up with 2°C in the caravan. 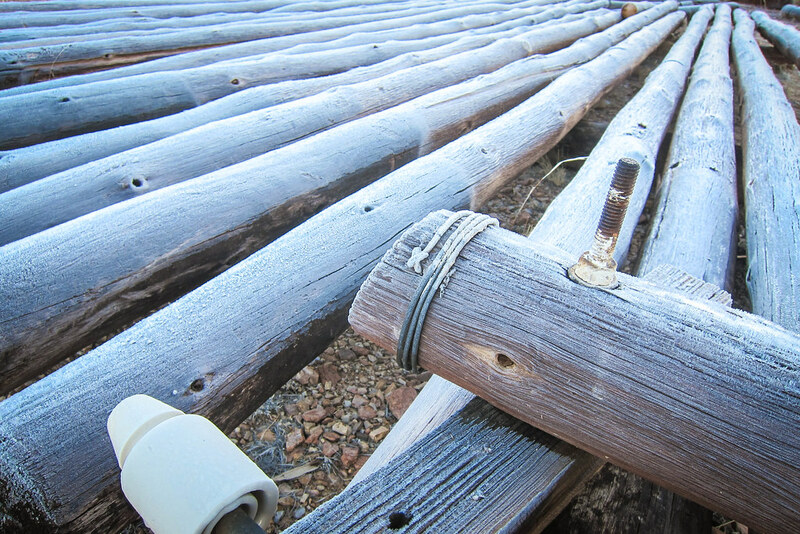 Only the thermometer and my nose felt that temperature, since the rest was cosily mummified in my sleeping bag. The frost is covering the farm, which borders the Namib desert. Interesting … but super cold to be outside on a saddle. My hosts are very kind, and I have to decline their offer to carry meat. I don’t doubt they have delicious oryx steaks, but since it’s very unlikely I can cook meat with my kind of spaghetti-only stove, the only meat I agree to carry is dröewors and biltong, the spiced and dried one. I thought Aus was only 40 or 50 km away, but it’s in fact 70. So it will be my goal for the day. The blue sky is back, proving that the rain and the clouds didn’t belong to that part of the world (well, one day of rain is still pretty good for a winter). The frost is whitening the baby grass, apparently the first time in years. If yesterday’s rain had continued through the night, it would have snowed. Snowed in the desert! 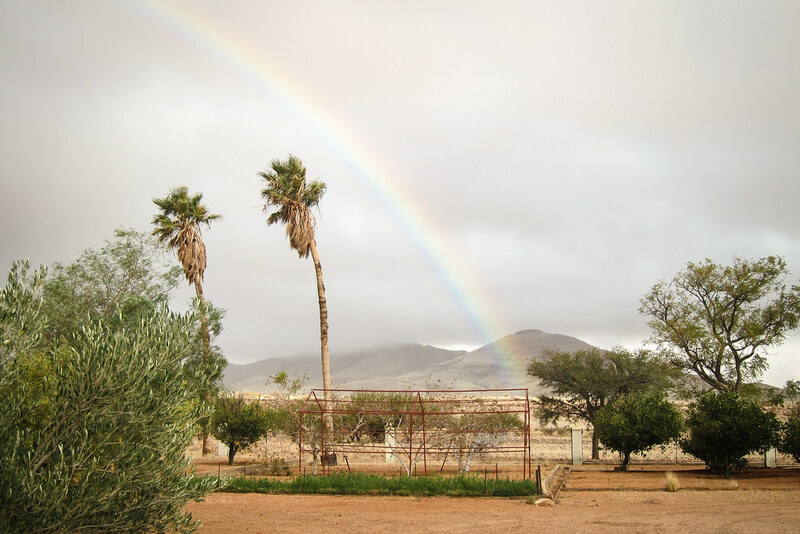 Despite the harsh conditions, my hosts still deal with their 300ish cattle on the 22000 hectares of the farm, and also grow some oranges and lemon. 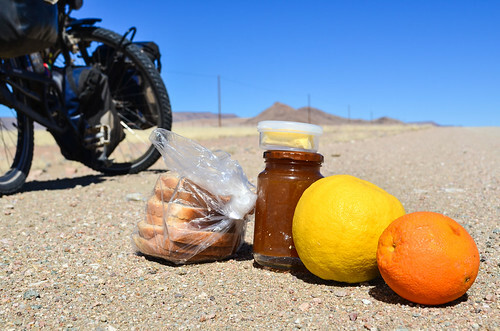 Sonia gives me homemade sour lemon jam, homegrown oranges and a grapefruit for the road. The wind is strong, but luckily in my back until Aus. 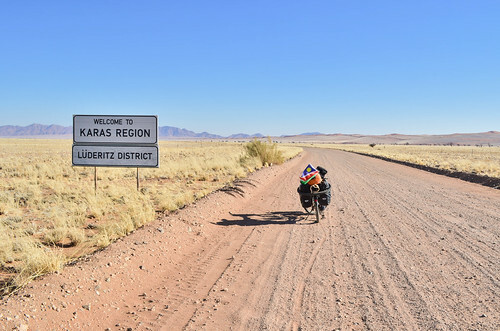 I am told that the road should be okay until Lüderitz, but I may get sandblasted there, and strong headwinds for the way back. Lüderitz is at the dead end of a 120 km long desertic road from Aus, and because of the Sperrgebiet, there won’t be any shelter alongside. I had abandoned the idea of making this detour, but if my rear rack feels fine, I’ll be checking this strange place! I am officially done with the mighty D707 when I join the C13, still with the tailwind. 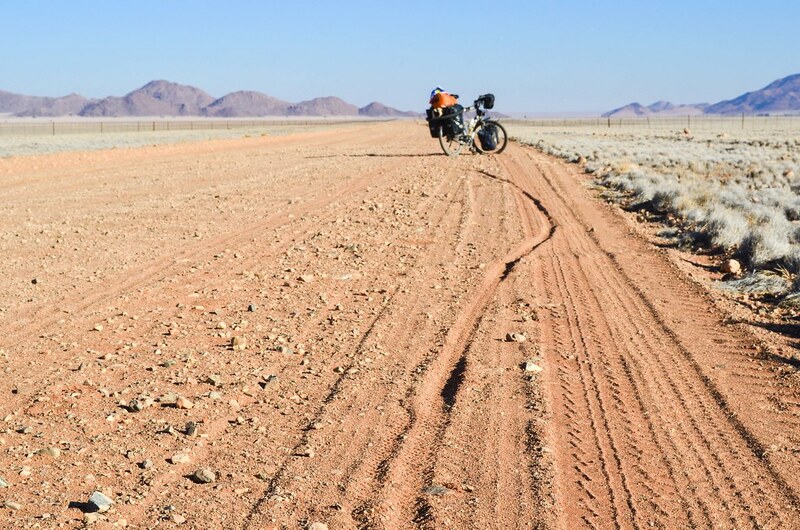 It doesn’t change much, it’s the same gravel but a bit wider. Since there is no point hoping for a corner of shade, and no point either risking the thorns of the yellow grassland, I can just have my lunch right on the gravel road. After all, it’s Namibia, so it’s very unlikely that I will have to get up from the road because of the traffic. 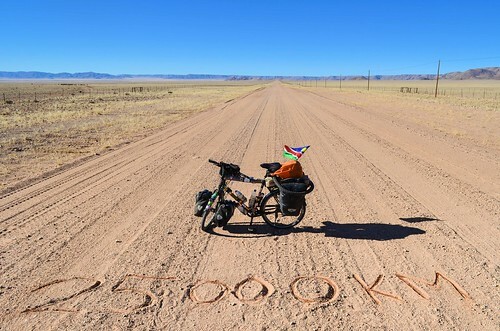 After passing the 25’000 KM mark, a long and beautiful uphill takes me until Aus. The patch for my rear rack is holding it well, and I will make it to the tiny town before sunset. All izz well! Looking backwards … So I have been on a straight line for 2 hours? I reach Aus at 5. 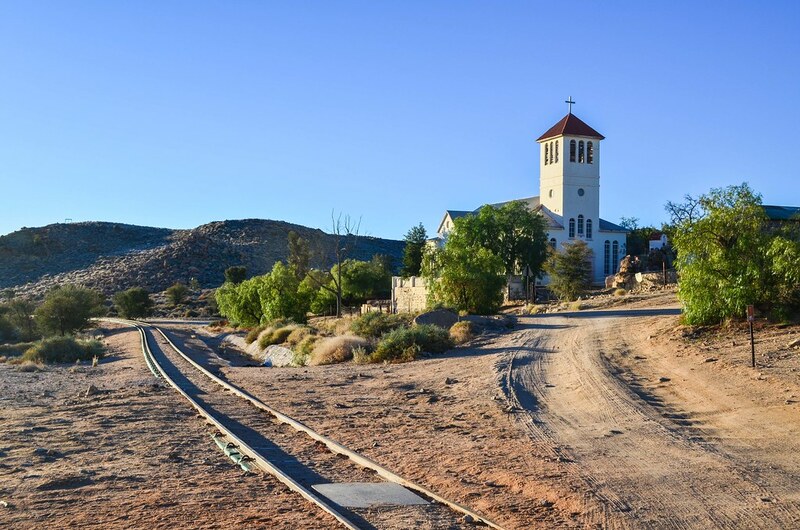 There are Nampower electricity cables … back to civilization! It is always a special feeling for me, to see a tar road after a long time away from it. This time, I have been continuously cycling on the gravel for 14 days and 700+ kilometers! 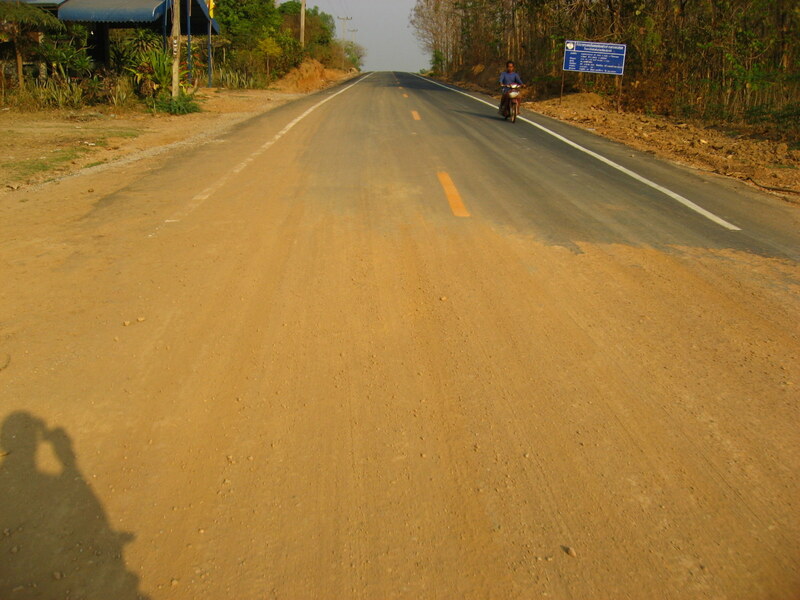 To this day, I still remember very well the time I met the tar again in Northern Thailand, after 2 or 3 days more or less lost on red dirt roads. It was this moment, six years ago. I have to patch everything, since I need to make my gear hold on an extra 1500 KM. Most of my items/tools/gear are reaching their end of life. My phone battery, on which I heavily rely for GPS tracking, doesn’t even last a full day now. My camera batteries only last 2 to 3 days. It’s high time to get to Cape Town! “Back to civilization” also means I get the 2G to check the news on my phone, and catch up with the latest important events: Gaza, Ukraine, airplane crashes, Francois Hollande and ebola in Nigeria are on the menu. The Excelsior farm is not really missing anything. I drove D707 earlier this month (proof: http://netllama.linux-sxs.org/pix/trips/2016-11-namibia_safrica/262.html ). Your website was my inspiration for doing it (rather than the more ‘popular’ C13 route). For the most part, it wasn’t bad, although there was a small section that had some tricky deeper sand. Pretty impressive! As I am a female photographer writing from NYC– what an adventure… amazed at the images of wildlife– isn’t it of concern when camping??? Can women do a trip like that? Oh well– imagelady wishing u well from the village! Any more sites of photographs??? Thanks! I think there is only little threat for a human. Dangerous predators are almost locked up in game reserves. Women can obviously do it, check http://helenstakeon.com/ for inspiration. Namibia is a paradise for photography, I wish you can visit it soon! Hi there, I just read your piece about the D707. I drove the road with a landrover last year despite being warned about the road condition. I actually found the road to be in a very good condition! 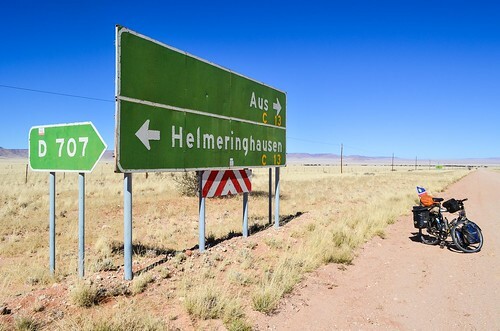 I am planning on doing it again in March this year, but this time on my motorbike – an 800cc BMW GS. How did you find cycling the road? You say you got a lot of sand / loose gravel? Was it any different / worse than the C13 and C27? You can email me directly if you so wish. The C13 was great for me, I think it doesn’t even have sand. The C27 was a pain south of Sesriem, I passed just after grading and it was all loose gravel. Fantastic to read this part of the blog again after some time. 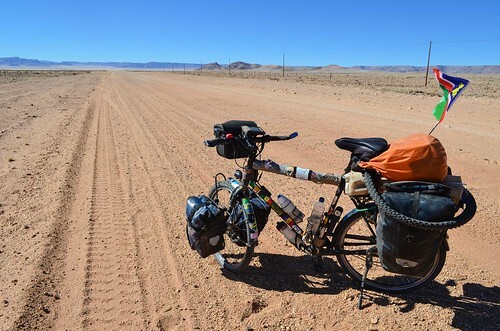 Well as you know we drive a land rover as well as cycling with heavy laden touring bicycles. I can assure your reader Christo there is a world difference as you duly noted in your explanation and he is welcome to contact me to have an experience cycling fully laden and your only propulsion is your legs and neither a power full designed diesel engine or a superbly designed BMW motorbike. JB what did your bicycle weigh with water added on on those remote roads? 40 kg + 10 kg for the water. Hope all is well and are you cycling or settled back into the rat-race. Please send me your e-mail adres so i can forward some pics to you. 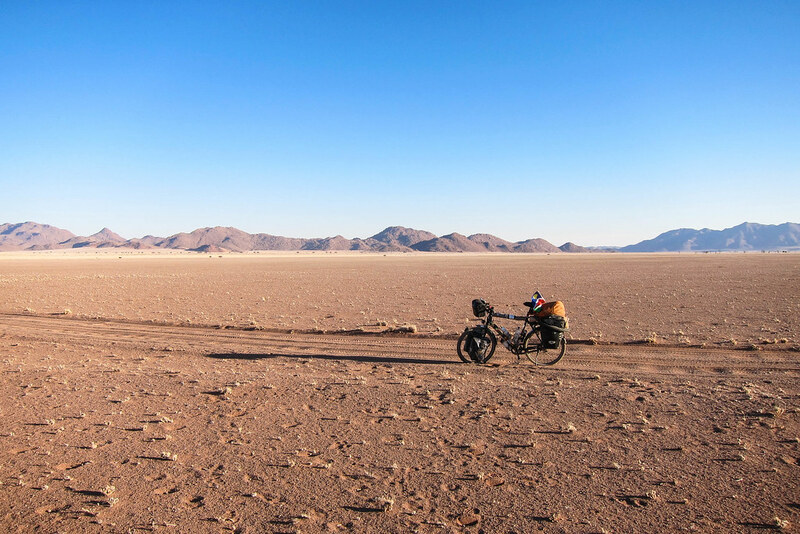 Yes, for Namibia it’s lots of work, but it will come soon(ish)! Have you any more long trips planned anywhere over the next couple of years JB? PS I like the music you play on the videos, it adds to the mood for the various places very, very well.